c is for contest, cleveland, and creative! the first person to post a comment which correctly identifies the architect of the iconic cleveland building above captures the prize - a cool cleveland cadeau! 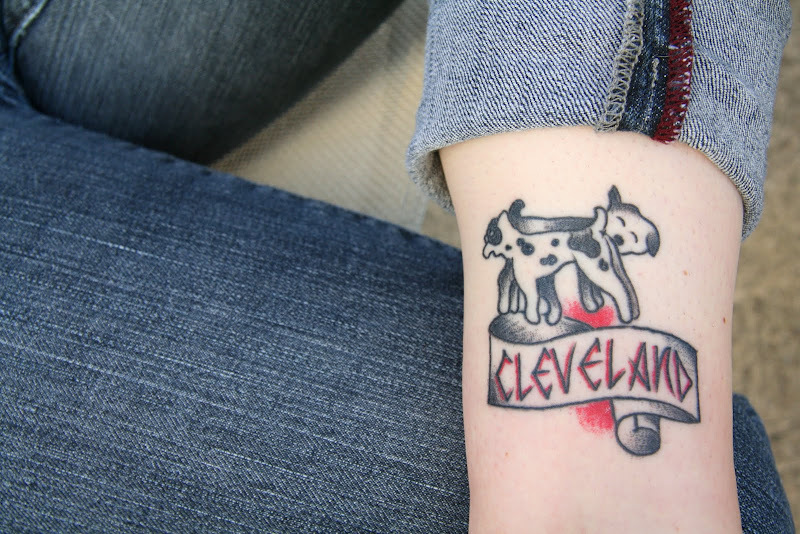 cleveland folks love their tattoos....not as elaborate as adam wilson's tat celebration of cleveland r's tat is creative and shows off what I've been told is the cleveland handshake. in 1979 ian hunter (former lead singer of british rock band mott the hoople) released his song cleveland rocks. the song immediately became the de facto theme song for the city. according to hunter "the inspiration for 'Cleveland Rocks' goes back to the old days when people used to make fun of Cleveland. Cleveland was 'uncool' and LA and NYC were 'cool'. I didn't see it that way. Lotta heart in Cleveland." soon after hunter released the song, then mayor dennis kucinich presented ian with the key to the city. most folks know the 1997 version of the song, covered by the presidents of the united states and used as the theme song for the drew carey show. I don't know the answer to the question, but the building puts me in mind of the balance of life. I admire the spirit of Cleveland, sometimes down, but never out. I...am...clewless...and good to see Ian still has it( wasn't he in studio the last couple of years? )Cool tune, kimy! no one is a winner yet....I suggest folks read the question carefully! 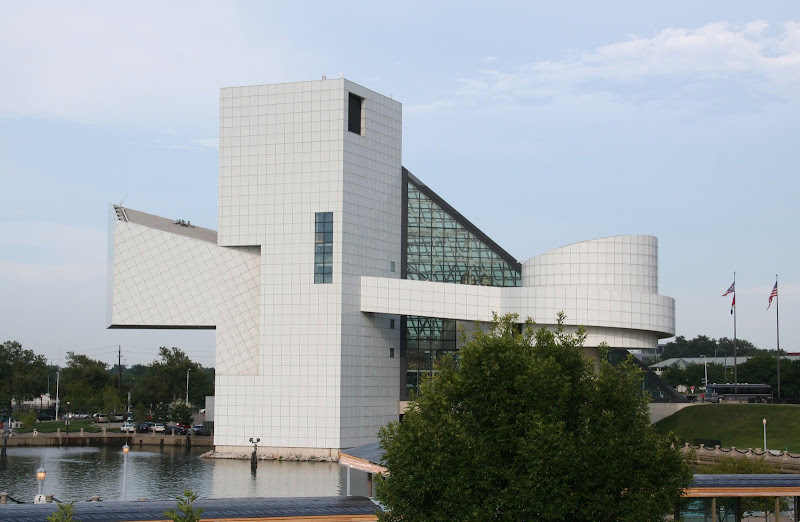 The R&R Hall of fame was designed by I.M.. Pei, wasn't it? My knowledge of architects isn't all that good. Ricky says I.M. Pei, and I know Pei designed that pyramid entrance-thingy for the Louvre, but that's all I know about him. And Frank Lloyd Wright's houses, and Bucky's geodesic domes. There you have it - my entire knowledge base on architects. I never had a chance at that hat, did I? Heh, heh! Argh! I don't know the architect. So tempted to look it up!!! No idea about the architect but I'll Google it! Haha, the Cleveland Handshake and Ian Hunter used to be a favourite of mine I'd forgotten all about him. Having now read the question carefully, I say it's the Cleveland Cantilevered Candelabra. That's my final word. I'll admit to looking it up (oops!). But I've never even seen a picture of this building, 'til now. I don't fancy the admission price! drumroll please.....we have a winner! former clevelander ricky nailed it - it is i.m. pei....now, ricky you need to get yourself to visit one time up are up visiting your rents! roy - although your state your knowledge of architects is limited it was enough to answer correctly! for that I'll be mailing you a cleveland postcard!! oldfraud...you did id the building so if you email a snail mail address you too can receive an authentic cleveland post card! megan - you get a post card too! roy and megan, have your addresses! oh merle, you are spot on cleveland sometimes is down, but the spirit is never out!! i know that's the R&R Hall of FAme but don't know the architect. I am curious. How did Cleveland get to build the R& R H of F anyway? CA Girl, from Wikipedia: "Cleveland lobbied hard to be chosen, citing that Cleveland disc jockey Alan Freed is widely credited with promoting the new genre (and the term) of "rock and roll", and that Cleveland was the location of the first rock and roll concert. Civic leaders in Cleveland pledged $65 million in public money to fund the construction. A petition drive was signed by 600,000 fans favoring Cleveland over Memphis, and a USA Today poll which Cleveland won by 100,000 votes. The hall of fame board voted to build the museum in Cleveland." But having the museum wasn't enough to build some respect for Cleveland; it wasn't until a year or two ago that they finally moved the induction ceremony gala from NYC to Cleveland. Thank you Ricky! I'm glad you researched that for me. I have wondered for ages. Alan Freed makes sense. even if Cleveland can't get no respect, I hear the ball park is dynamite too. actually, I've heard it's a lovely city.